For another because it’s new. To be found in the earth or air today! At least—they declare it is so! With its hundred thousand slain. Who does? Won’t somebody tell? Who dogs the steps of the toiling saint? Who sows the tares in the world’s broad field. Where the Saviour sows his wheat? Is the verdict, therefore, true? The devil was thought to do. and digs the pit for his feet? the devil alone should do? is nowhere to be found? for surely we want to know. and of course, the devil is gone. who carries his business on? 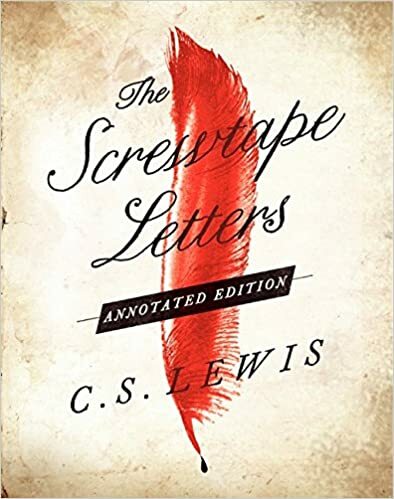 So if you haven’t seen or read C. S. Lewis’s book, The Screwtape Letters, let me recommend it. It provides a biblically informed fictional look at what may be going on in the spiritual world as a younger demon, Wormwood, is mentored by his Uncle Screwtape as they try to prevent a salvation then work to harass the new believer.